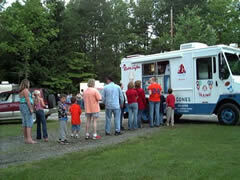 As the recession forces people to consider new income opportunities, the ice cream truck business has many benefits, says Shoestring Publishing. The course is taught by expert marketer and lifelong entrepreneur Perry Belcher. A new course from Shoestring Publishing says that the ice cream truck business can be a cash cow for startup entrepreneurs looking to start their own startup business. For those who are interested in starting a new business, starting an ice cream kiosk, ice cream shop equipment or opening an ice cream shop, the course is a complete plan taught by people who have successfully owned this type of business. The course is taught by expert marketer and lifelong entrepreneur Perry Belcher, who has made over 100 million dollars in sales of his own products. Mr. Belcher started out with his own ice cream truck business that he says became very lucrative for him, and for which he gives all the necessary startup information in the course. Mr. Belcher says that the ice cream truck business can be started on a shoe string budget: "I'll show you how to get started in the ice cream truck business for less than $1,500. Now I'm not saying you're going to have the Cadillac of equipment and everything that you need, but you can certainly get started there. Then you can purchase new equipment and more supplies out of profits, not out of your pocket when you start." For more information about how to start an ice cream truck business and how to start a business, visit the website Ice Cream Secrets. Shoestring Publishing brings the very best in business startup courses to the public. The recession has increased the number of people wanting to start their own businesses and Shoestring Publishing provides the books and courses to help people setup their own startup business, and to explain how to start a startup. Shoestring Publishing creates courses on how to start a startup business.